Create a group – all of it’s members will receive a copy of the email to this group. Sending from this group is also possible, but recipients (in Gmail) will see “john.smith@example.com via gmail.com”. Some claim it is unprofessional. We think it is minor. This method also saves you from creating new users – in free version you are limited to only 10. 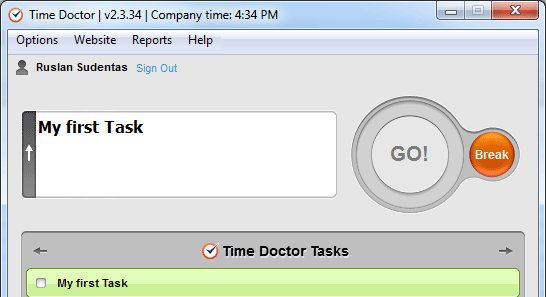 Employee monitoring software has become commonplace. 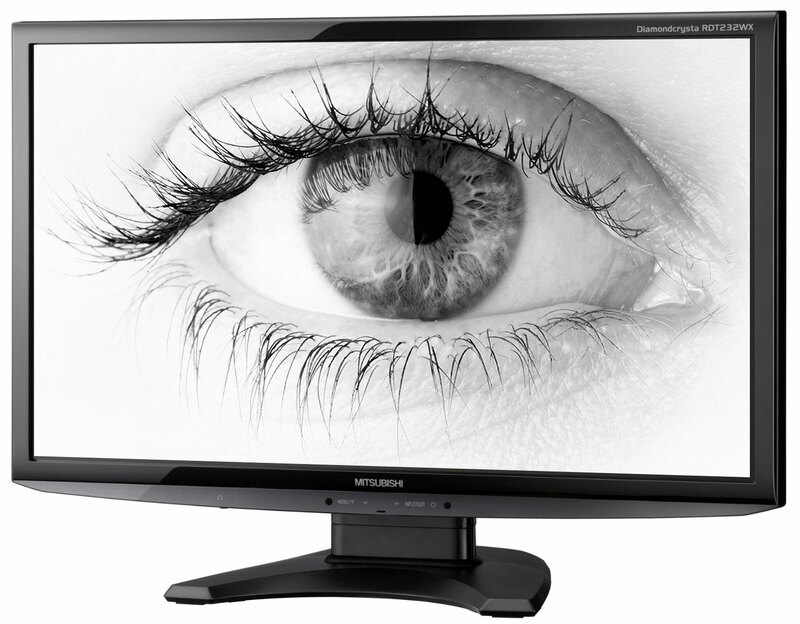 Many apps take monitor screenshots, capture keystrokes and mouse movements, monitor active applications and visited sites and, in extreme cases, can even take pictures using webcam. It seems to be fair to track what your employees do when they are being paid for their time. After all, if they exchange their time for money, it seems fair for the employer to know what they are paying for. So, why does it still feel morally inappropriate in some cases? The question is far from being just theoretical. If a wrong decision is made, a company may suffer from lawsuits, experience a backlash and overall productivity drop (opposite from what was intended) from their employees or suffer damage to the company’s image. Let’s review in more detail what employee monitoring practices can be considered valid and what should be avoided. Amazon S3 is a great and cheap place to keep your SQL Server database backups. 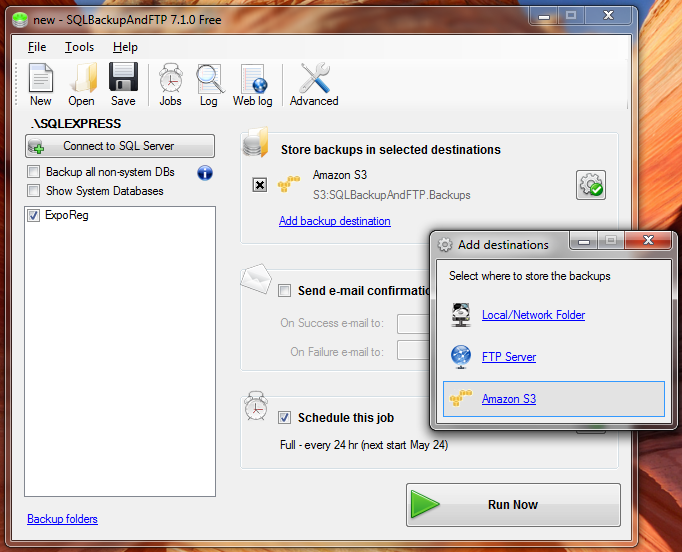 SQLBackupAndFTP starting from the Standard version now allows you to backup SQL Server databases to Amazon S3 directly. Google Drive starts you off with 5GB for free. Seems like a great place to keep you SQL Server database backups. SQLBackupAndFTP starting from the Standard version now allows you to backup SQL Server databases to Google Drive directly. 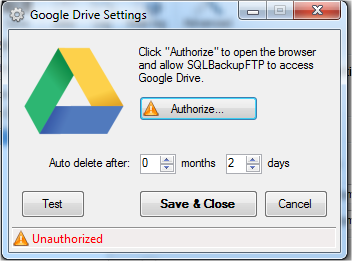 On the main form just select Google Drive as your backup destination, authorize the program with Google – and you are done! SkyDrive from Microsoft gives you 25GB of cloud space for free. Seems like a great place to keep you SQL Server database backups. When you install SkyDrive, it creates a special folder. Everything that you put into this folder will be synced to the SkyDrive servers in the cloud. Open SQLBackupAndFTP, select databases to backup, check “Store backups in a local/network folder” and set the folder to be that SkyDrive folder. Note that there’s a big drawback – SkyDrive will sync only when you are logged in. Currently Microsoft has given only Windows Phone and Windows 8 platform developers access to the full SkyDrive API – see this blog for details. Until MS opens up their API, we will not be able to add SkyDrive as a backup destination to our products, sorry. Dropbox allows you to store 2GB for free – this should be enough space to store SQL Server backups for the majority of small clients. 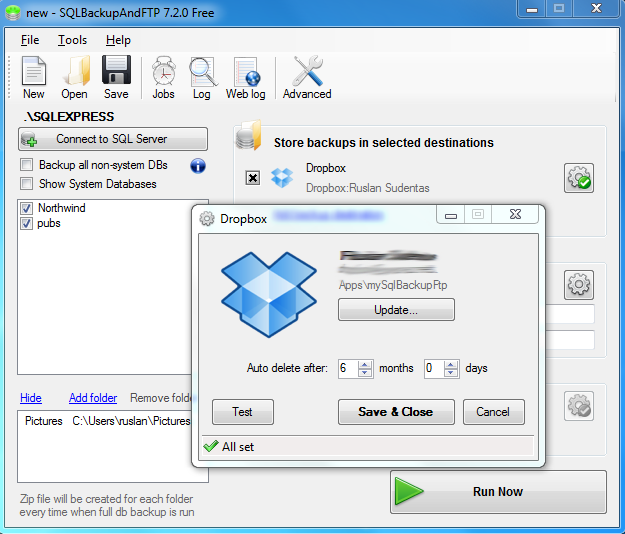 Free version of SQLBackupAndFTP now allows you to backup SQL Server databases to Dropbox directly. When you Remote Desktop to a Windows XP Professional computer, you always connect to the console (main/default) session. This is the default for Remote Desktop to Windows XP Professional. When you remote desktop to a Windows Server 2003 computer, the default is to start a new session.